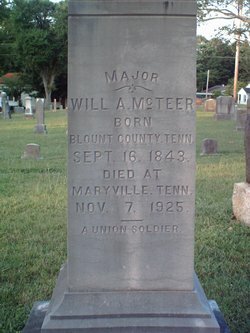 Major William Anderson McTeer was born on September 16, 1843, six miles east of Maryville, in the Ellejoy area of Blount County, to Andrew Bogle and Nancy Gamble McTeer. 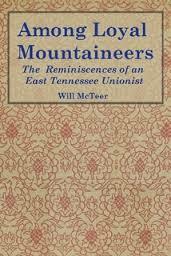 When he was nineteen years old, McTeer enlisted in Company A of the Third Tennessee Volunteer Cavalry on August 10, 1862, to fight for the preservation of the Union. At the time of enlistment, he was 6 feet tall with fair complexion, dark hair and blue eyes. On April 4, 1864, he was promoted from private to 2nd Lieutenant and on July 19, 1864, he was promoted to 1st Lieutenant and Adjutant. During his last year of service, he was assigned to duties as Acting Assistant Adjutant-General of the Brigade and then of the Division. He was discharged as Major and Adjutant of the 3rd Tennessee Cavalry Regiment on August 3, 1865 at Pulaski, Tennessee. After the war, however, Will McTeer wore many hats. In addition to his role as a Federal soldier that is recounted in his book, he was elected Circuit Court Clerk for Blount County in 1868, an office which he held until 1878. Additionally, McTeer practiced law in several prominent Maryville law firms from the time he was admitted to the bar in 1878 until his death in 1925. After serving as Court Clerk, McTeer served as United States Commissioner from 1878-1896, and then again from 1912-1925. During this time period, he was also a member of the Tennessee Legislature in 1882 and was the first recorder of the City of Maryville from 1907-1917. In the private sector, McTeer and his friend Calvin A. Duncan were elected by the Presbyterian Synod of Tennessee as Directors of Maryville College. He also served as Treasurer of the college from 1884-1901. McTeer was also one of the organizers of the Bank of Maryville in 1885, and served as its President. He also served for thirty years as Superintendant of the Sabbath School of New Providence Presbyterian Church. 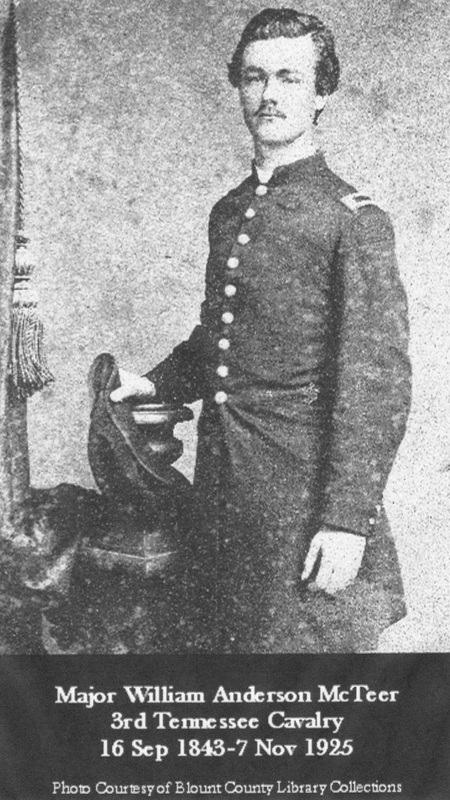 McTeer published his wartime memoirs in serial form in the newspaper The Knoxville Daily Chronicle between February 16, 1879 and April 30, 1880. It was later published as a book and has been re-printed into many editions over the subsequent years. While there is no e-book currently available, it is in the collection of many libraries and can be purchased in paperback edition from a number of sellers. 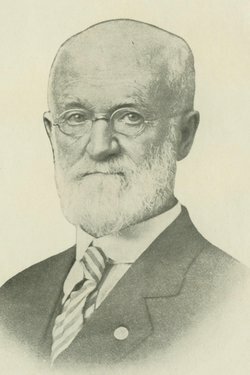 McTeer also compiled through personal contacts, Blount County records and wide correspondence from 1900-1925 a manuscript entitled “McTeer Family History”, which is now on deposit in the McClung Collection of the Lawson-McGhee Library in Knoxville, Tennessee. 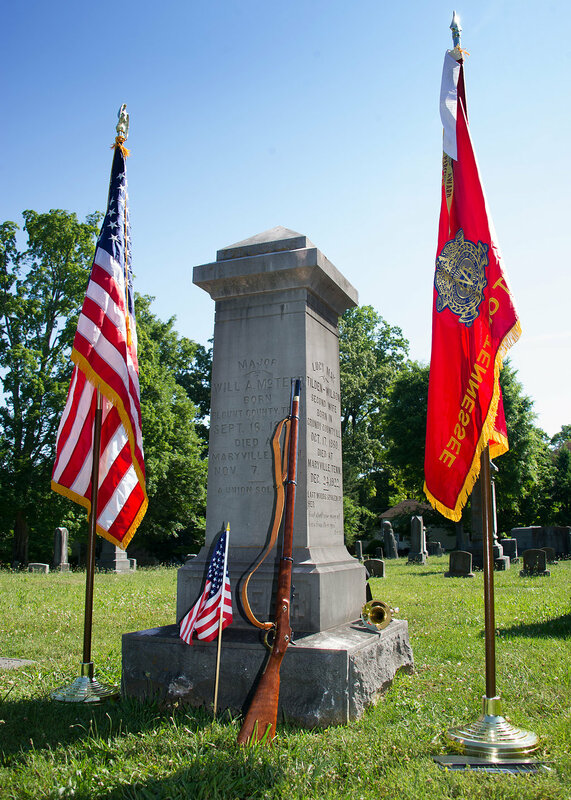 McTeer is buried at the Magnolia Cemetery in Maryville, TN where there is a large monument which simply says “A Union Soldier”. Hi, I am ashamed to say that I had one of the original hard copies of his book that was published and lost it during a move. My family is from Maryville and he is related and my grandmother had the book. I grew up on a farm in Maryville that had been a dairy for over 100 years before the last twenty acres was finally sold over two years ago. I am not really much of a history buff but my father is and now my son who is eleven is. I am trying to track down one of the books to at least give it back to my father. I really have no idea where to start or how to try to get more information. I would love to find a hard copy for my dad. Any help is greatly appreciated. The Blount County Historical Society sells hardcopies of the book. They had them reprinted a couple of years back. You might contact maxrenfro@gmail.com for more information. He is the President of the Society. The Blount County Genealogical and Historical Society (BCGHS) sells Loyal Mountain Troopers: The Second and Third Tennessee Volunteer Cavalry in the Civil War. This book entails the reminiscences of Lieutenant John W. Andes and Major William A. McTeer. The book was initially published in 1992 by the BCGHS and edited by Dr. Charles Samuel McCammon. The 1st edition is a blue hardback cover and now sold out. The 2nd edition is a blue softback cover. It appears that the book you are referring to is The Autobiography of Major Will A. McTeer 1843-1925 published in 1968 by Brazos Press and edited by Marion R. Mangrum. The book is a burgundy color. Fortunately, I have a copy in my possession. Judge William Andrew McTeer, Major McTeer’s nephew, supplied the narrative to Mrs. Mangrum. She initially published portions of the autobiography in regular issues of the Maryville Enterprise. I am trying to find an article (extensive apparently) that was written by a McTeer and published in a Knoxville newspaper in 1925. The subject was the Kirk Massacre (1788). Any idea if the writer was this McTeer? I have no idea but I doubt it. He would have been age 82.